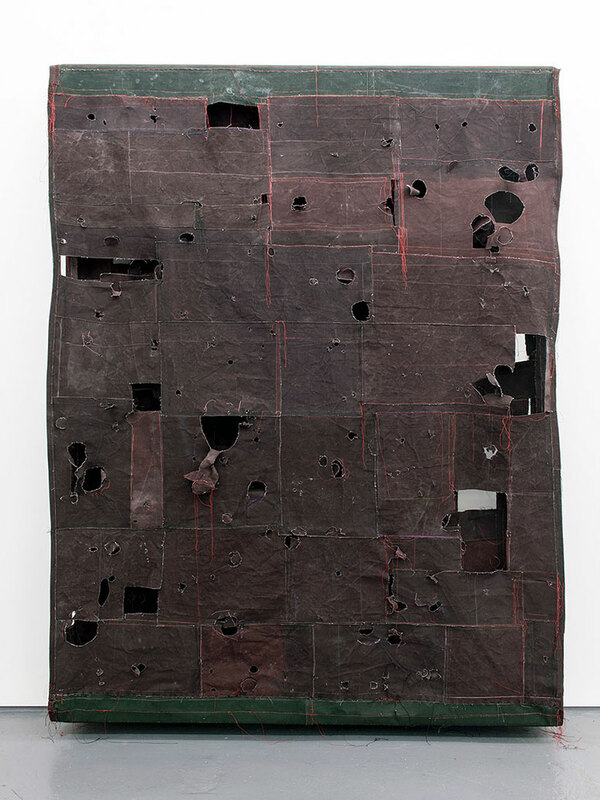 Although it could be said that Simon Callery’s new paintings conform to conventional image based painting – in that they are flat, ‘hangable’ and rectangular – they are in fact they are made to Callery’s alternative conventions and are in many ways closer to sculpture. The paintings on show are all made from the same starting point – an excavation in Moel y Gaer, Bodfari, North Wales, led by the Institute of Archaeology, University of Oxford. The impact of this landscape and excavation site on the painting results in a group of works that expose all evidence of the making process as significant features in the completed work. They reveal to the viewer multi-layered external and internal surfaces and voids. These canvasses have been soaked with highly saturated pigments and have been cut and stitched. They are ragged, torn and perforated.